Edible method: heats up 2 minutes with the microwave oven mid-fire, heat saves can direct edible. This product really made me feel nostalgic for my years at the orphanage. I’ve tried to imitate that orphanage gruel but I’ve never been able to get it just right. And while you’re finishing your morning bowl of gruel, why not click on over to vote in the caption contest? ← Complete and Utter Rubbish! For that authentic orphanage taste, you need to shed some tears in it. How could I have forgotten the special seasoning ingredient? Or maybe they did check but the consumption of gruel had some copyediting side-effects. The best part of the gruel is it packaged with no second helpings…. Please sir, may I have some more? How do any of the only English speakers there manage to cook anything correctly? That’s their evil plan. First, starve off any foreigners on their shores, then move on to conquer the world ! my refrigerator can handle that >65 C. it’s a bit odd, though, as it looks just like an oven. I like how you warped into the future for that second photo. Did Doc Brown go with you? How were your kids in that era? 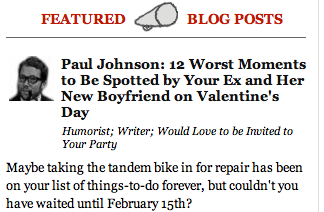 Why did you bring back macaroni and gruel–and not a hoverboard? Maybe the crawfish eyeballs are why they think it’s called gruel. I want to know where I can get my hands on some heat saves. What? No photo of Oliver Twist on the package? This is Chinglish. They would get that SO wrong. It would be a sinister picture of a Twisted Oliver instead. Mmmm, whole grain gruel, just like the warden used to make. I’m sticking with bread and water. “Please sir, may I have some more?” I’m picturing then-child-hearthrob Mark Lester in his greatest (and only) movie role as Oliver. Actually, those macaroni instructions kind of make sense to me — the “danger zone” for bacteria growth is supposed to be from 40-140 degrees F, so keeping food colder (in the fridge) or hotter than that (e.g., keeping a big pot of soup simmering on the stove all day). And the directions to cook it “mid-fire” is probably just some terminology left over from the days when everyone had a coal-fired microwave. These Chinglish posts are priceless to me having lived in Vietnam! Too damn funny! 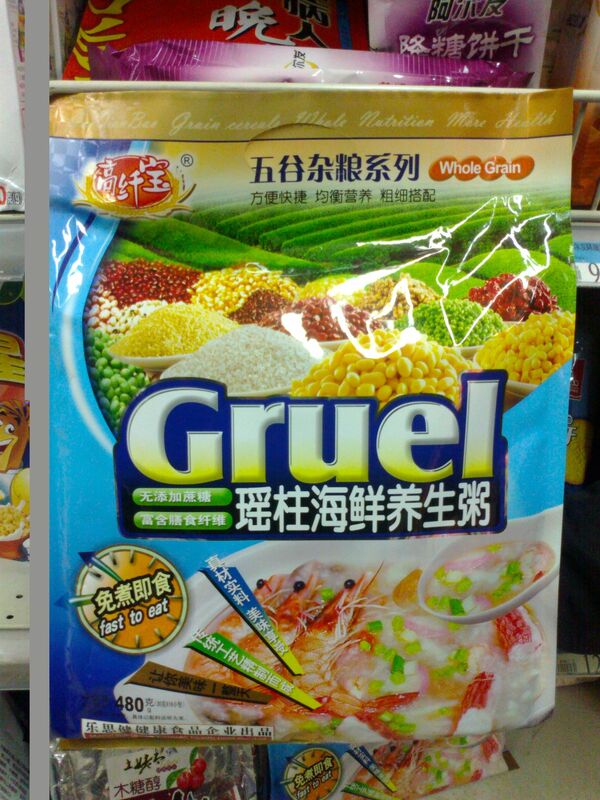 Really, now– can gruel be any other way but cruel? Wow. I’m having a big flashback to sixth grade when I had to stand on stage and sing Food Glorious Food wearing some cut-up polyester slacks. 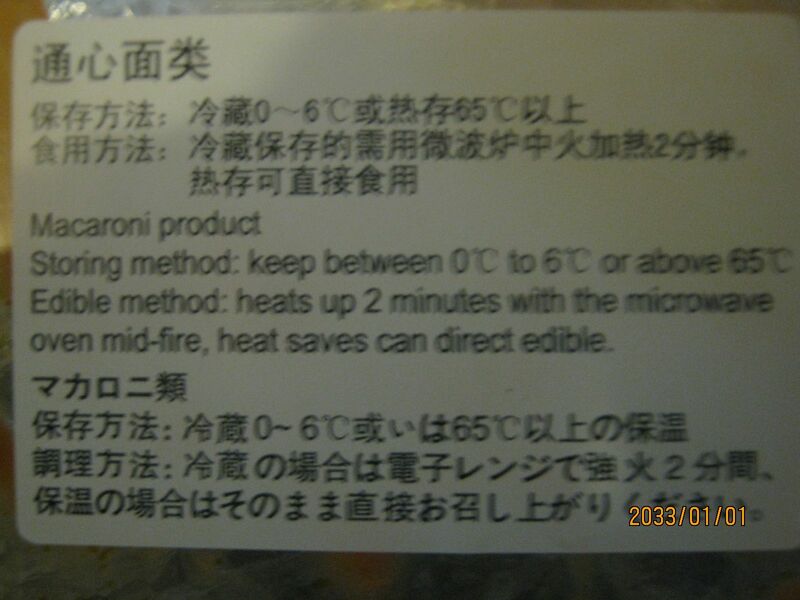 In Chinese, it says that you can heat it up for 2 minutes with the microwave with medium “heat” (I guess they meant power) or, if you’ve previously stored it above 65 degrees, you can eat it immediately. It’s still puzzling how they expect you to go about storing it above 65 degrees. I can’t imagine anyone making any sense of the English instructions though! Whole grain gruel? That must be for the top 1% orphans. Have you figured out how to get your microwave to shut off at mid-fire? Does the package indicate whether the kids like it? This would make a great diet, because all of a sudden, I’m not hungry any more. “Heat saves can direct edible” is simple. If you don’t save it from the heat (mid-fire) then it isn’t going to be edible. If I grill burgers mid-fire, chances are, we’re going out for gruel. Those macaroni instructions made my head hurt. Think I’ll stick to gruel. I’m not sure what all the hub-bub is about, I mean what’s wrong with a meal that’s “direct edible” AND also doubles as decoupage paste? Only a fool eats cruel gruel. The eyes make me drool. Good poem. I’ve been calling for similar treatment of elves for years. You gotta Gruel to be kind!